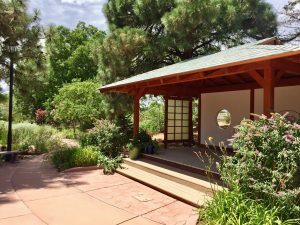 The Albuquerque Garden Center has two rooms that are available for your private event. The Pinon Room accommodates up to 200 guests and is ideal for hosting a reception, anniversary, reunion, or quinceanera – with space for catering, a DJ, and a dance floor. The Patio Room accommodates up to 60 people. It is perfect for any small gathering such as a baby shower or small reception. In addition it would be an ideal compliment for a ceremony and/or party in the Pinon Room. Both rooms allow access to our full service kitchen for pre-prepared or catered food, two sets of restrooms and our lovely Marie Torrens Courtyard. The entire facility including the private Gardens and both rooms can accommodate a garden ceremony with direct access to the reception room from the gardens. Our Gardens provide a perfect back drop for your event as well as photographs. Wireless Microphone, Sound System, Podium, and/or Projector may be rented for an additional fee. Arrangements must be made at time of rental and fees paid at least 2 weeks in advance. To reserve your date, The Garden Center requires the damage deposit for the package of your choice, a valid Driver’s License and Credit Card in the renter’s name and a signed rental agreement. All damage deposits are fully refundable as long as the room(s) and/or gardens are returned per the rental agreement and all policies and procedures are adhered to during your event. Renters are allowed to serve Alcohol by submitting an additional non-refundable fee along with the rental fee. Renter is responsible for purchasing license through the Center’s contracted Concessionaire at least 60 days prior to the event. The Garden Center has 70 6’x3′ tables and 200 chairs for the hall included in the rental fee. Only outside rental chairs may be used in the Gardens. Rental fee does not include the set up, however it does include the break down and storage of tables and chairs, and the basic cleaning of the facility after your event. Rental fee also includes 6-8 hours of Facility Monitoring for your event which is provided by the Garden Center to ensure adherence to all policies and regulations set forth in the rental agreement.